Gorgeous light on this beautiful male Monique! Good pose mid-stride and terrific lighting, Monique. Isn't he handsome! Love seeing the stride and intent look in his eye. Gorgeous light- well done!! This guy is on a mission. Nice alert look and great job in catching him in stride. You certainly captured him on the move, makes the viewer wonder what lies outside the frame. 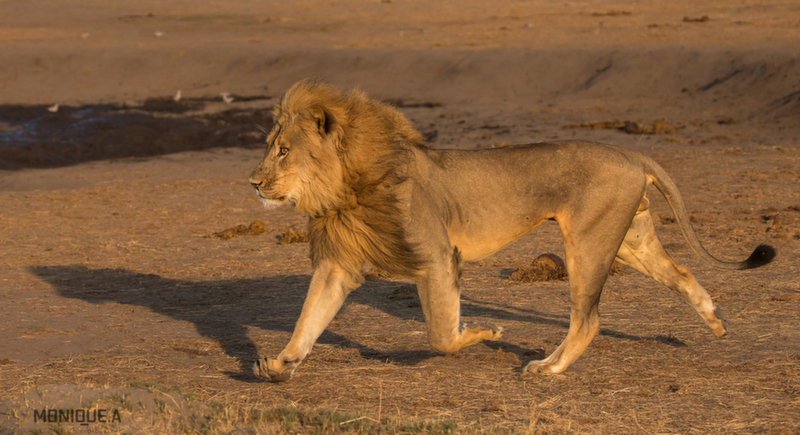 For those who were left wandering, this lion was rushing to join his three pride lionesses who had come across an elephant carcass during the night. The lionesses had beaten him to the carcass and were already feeding on it when he came across the rise. Once he saw what was happening, he rushed to join them! A classic case of FOMO! I had been busy photographing the lionesses and so he gave me a wonderful opportunity! Ah! that explains it, no wonder he's in a rush! What a magnificent specimen, in his prime and such gorgeous light to show him off. Beautiful image, Monique.